How to find the slope of a parallel line? 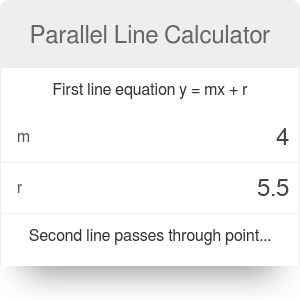 If you're scratching your head while trying to figure out some parallel lines equations, stop worrying: this parallel line calculator is precisely the tool you need. In just a few seconds, it will determine the equation of a line that is parallel to a given line and passes through a given point. That's not all, though: our calculator is also able to find out what's the distance between the two lines. Read on to discover how to find the slope of a parallel line, or what a y-intercept is. Also, make sure to check out the perpendicular line calculator! The equation of the given line is y = mx + r. You know the values of m and r and are looking for a line parallel to this one. Once that you know the a coefficient of the line, all that is left to do is determine the b coefficient (also known as the y-intercept). The method is straightforward: you have to substitute the coordinates (x₀,y₀) and the value of a into the equation of your line. Now that you know the equation of your new line, you can easily use it to determine the distance between it and the first line. In this case, the distance is defined as the length of the shortest possible segment that would join the two lines together. If you're still not sure how to find the equation of a parallel line, take a look at the example below! Write down the equation of the first line. Let's say it's y = 3x - 5. Write down the coordinates of the given point P that the second line will pass through. Let's assume it is (1,6). In other words, x₀ = 1 and y₀ = 6. Write down the equation of your new line: y = ax + b. You will try to determine the values of coefficients a and b.
a = m = 3. Knowing the values of the slope and y-intercept, you can now write down the full equation of the new line: y = 3x + 3. The distance between the two lines is equal to 2.53. Parallel Line Calculator can be embedded on your website to enrich the content you wrote and make it easier for your visitors to understand your message.